Ali Qureshi just wanted to play some pick-up cricket at Patten Gymnasium. Instead, he ended up transforming a ragtag group of cricketers into the popular Northwestern Club Cricket team, whose 35 members compete regionally throughout the fall and spring. 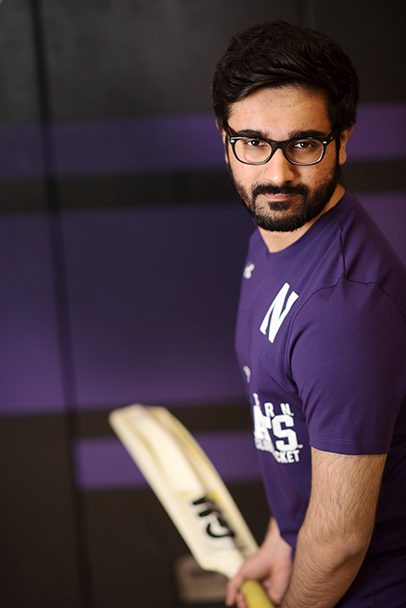 In building the team, which includes members from India, Pakistan and across the United States, Qureshi didn’t merely launch Northwestern’s 35th club sport. He also made it comfortable for the diverse team to connect across cultural differences. In recognition of his efforts, the Office of Student Engagement honored Qureshi with a 2017 Wildcat Impact Award. I grew up in Pakistan, where cricket is like a religion. You know how in America, you have the Super Bowl and the World Series? With all due respect, where I grew up, cricket is much bigger. It’s more than a sport for us. It’s a way of life. How did the Northwestern cricket team come to be? We started playing pick-up games in 2015 with about 20 players. Every week, more people started showing up. Eventually there were like 40 people. And that’s when the idea struck: if these guys can show up and play their hearts out in such an informal setting, what could we achieve if we became a club team? And it’s not just students from Pakistan. Sport is a universal language. When people are in a stadium cheering for a team, everyone is in sync. When students from Boston, New York and Chicago came to join the team, they had never even seen a cricket game before. But the energy on the field was so contagious that they became more passionate than us at some point. What makes this club unique? Initially we were just a bunch of guys running back and forth on a field. I thought, if we keep going this way and I’m the only one making decisions, we’re not going to go anywhere. I realized that a good leader is someone who creates more and better leaders. So we instituted rotational coaching, which gives everyone a chance to organize a practice. We also have a range of commit­tees overseeing things like grant applica­tions, logistics and finance. We even have an arbitration committee, because there can be occasional friction in a group of 35 unique guys. What have you learned as a result of this experience? The most important thing to me is that every single person who shows up to practice feels important and goes home feeling fulfilled. So after every practice, I try to evaluate myself and get feedback on how I can better provide that sense of respect and belonging. The importance of connecting with people individually and as a team — that’s what cricket has taught me.